This site is dedicated to those who prowl the streets on individual renderings of what they perceive a motorcycle to be. It is not intended to act as a playground for factory drones or corporate lemmings who are willing to settle for what Milwaukee now produces. 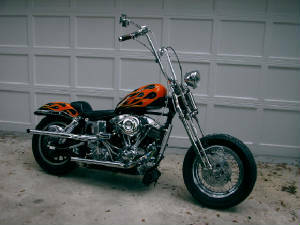 Rather, it is a platform for fostering an interest in owner built customs in an attempt to remind the world that choppers are still very much alive on the streets of America! You will not see two wheeled Winnebagos here. You will not see $50,000 billet barges here. What you will see is the hard work and imagination of the individual builder who constructs his bikes to ride not to park in front of the local latte emporium on bike night. This site will cater to the bar hoppers and the night riders. To the chopper loyalists and fabricator of vision. All others need not apply. Sporatic rantings will be available for your entertainment and your comments are always welcome. Just be warned. The opinions stated here are mine and mine alone. I am beholding to no one and I call it like I see it - I always have. Feel free to agree or disagree and respond accordingly by posting your comments in the guestbook or by firing off an e-mail to choppinit@hotmail.com Just remember that protracted vulgarity will elicit an equally caustic response!! You've worn the inside out.